Malabar Trogons are one of the three species of trogons found in India. The name 'trogon' means 'nibbling' in Greek , referring to the birds' habit of gnawing at tree barks to excavate holes for nesting. The birds are sexually dimorphic and monogamous, and are unique in the entire animal kingdom in having a heterodactyle foot arrangement! 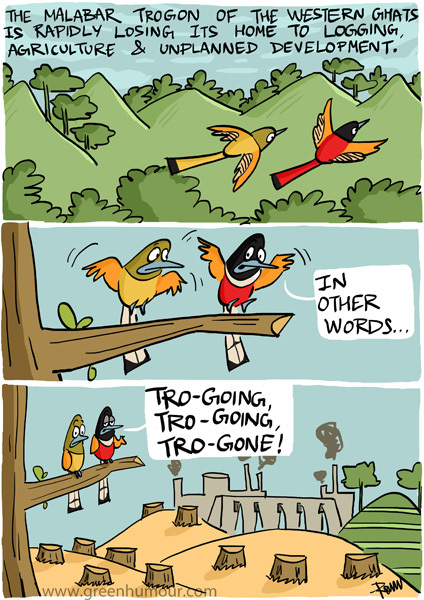 Heavily dependent on rainforests, trogons face a constant threat from logging and habitat encroachment. The comic appears in my column in The Hindu Business Line's BLink today.